Our latest e-newsletter was delivered to inboxes earlier this week announcing our Be the Change $10,000 Challenge for October and National Breast Cancer Awareness Month. This month, we challenge YOU to join our efforts and create an event that initiates positive change to help the 1 in 8 women who will be diagnosed with breast cancer in her lifetime, and the 1 in 100 men. Together, let’s raise $10,000!! Not sure how to start? You could host a pink wedding cake & tea party in your area, a Boobies for Boudoir portrait party or donate a planning or make-up consultation. Create a pink product all your own. Get creative! Share a percentage of your income for the month, quarter, or year to Pink Initiative. Brainstorm an event or product that best suits your business, and then announce on your blog and send an e-newsletter to your address book. Let us know, too, and we will post on our blog as well. Funds raised on your own may be submitted to Pink Initiative by check (PO Box 2703, South Portland, ME 04116) or via PayPal (payments to info@pinkinitiative.org). Or, let us help you get started! We have partnered with givezooks!, an online one-stop fundraising marketplace where you can easily create a webpage for your grassroots event to share with your friends, family and colleagues to drum up support, collect and track your donations directly. 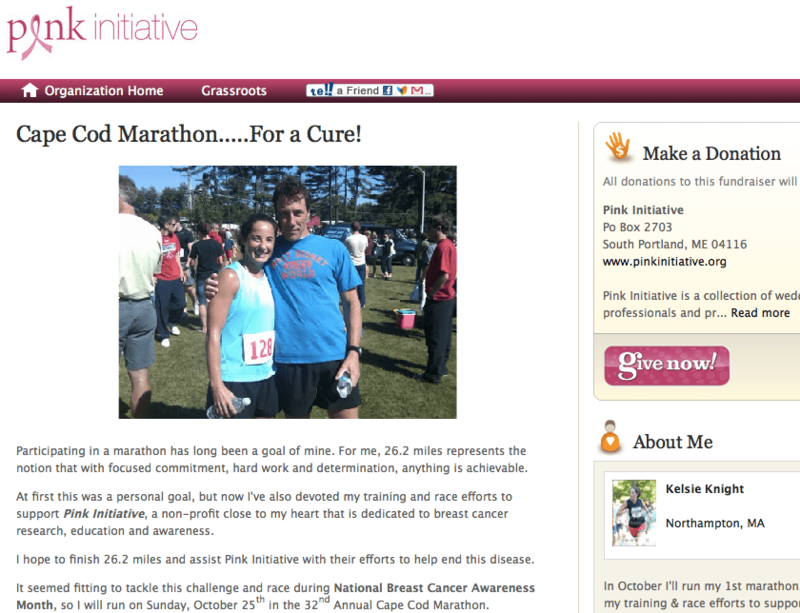 Check out Pink Initiative board member Kelsie Knight’s page below that she created for a marathon she is running to raise money for PI (click snapshot below to enlarge). Click here to read our e-newsletter in its entirety. And thank you in advance for your help this month, and always!